Media had reported in July 2016 that the Army had junked DRDO's 5.56mm Excalibur assault rifle. Resultantly, Army's quest for a state-of-the-art assault rifles was extended – fresh equipping taking minimum seven-eight years as per informed sources. The Infantry has been equipped with DRDO's 5.56 INSAS rifles for past two decades which still has over a dozen faults. Because of frequent stoppages, frontline soldiers in Siachen area keep an AK-47 next to the INSAS because of former's much better reliability during critical moments. It may be recalled that the global tender floated in 2011 (with MoD approval) for new generation assault rifles with interchangeable barrels for conventional warfare and CI operations was finally scrapped in June 2015 despite being termed "Priority I" for the 382 infantry battalions. Reputed foreign firms participated in the trials for the double-barrel rifles, Army having taken conscience decision to go for interchangeable barrels, which had MoD approval. The plan was direct acquisition of 65,000 new generation rifles costing Rs 4,848 crores to equip 120 infantry battalions. OFB was to then manufacture over 1,13,000 such rifles through JV with the foreign vendor providing ToT. The rifle was to weigh around 3.5 kgs with advanced night-vision, holographic reflex sights, laser designators, detachable under-barrel grenade launchers etc. It is not that the type of assault rifle the Army sought was not available globally, but what caused the tender to be scrapped was the DRDO coming up with the 'Improved 5.56 INSAS' dubbed Excalibur, which had been under development past several years. Ironically in 1980, 17 x 5.56mm rifles from 11 countries were imported by MoD to equip 3 x Parachute Commando battalions and 3 x Parachute Battalions. Despite successful trials, the red tape and mafia blocked imports, giving these 17 weapons to DRDO who took 15 years to produce the 5.56 INSAS rifle that was nowhere close to top 10 assault rifles of the world. The IPKF went to Sri Lanka in 1987 armed with the unwieldy 7.62 SLR rifles battling the LTTE armed with AK 47 assault rifles. Eventually, Army had to import 1,00,000 AK 47 rifles (then costing only US$ 300 apiece) to give 100 per infantry battalion in the IPKF. When the Army junked the Excalibur last year, the media was critical in saying, "The military wisdom till now was that the 5.56mm rifle was better for conventional war because it injured the enemy soldier, tying down at least two of his colleagues to carry him. Conversely, the 7.62mm rifle was better for counter-insurgency since terrorists had to be killed at the first instance, eliminating the risk of suicide bombing". However, the junking of the Excalibur must have also been because of it not meeting the qualitative parameters. Now the news is that the OFB proposes to send "in coming weeks" a new prototype of 7.62x51mm AR-2 assault rifle for trials by the Indian Army. AR-2 reportedly is the second version of the Excalibur 5.56 assault rifle which can fire the 7.62x39mm rounds. While other parameters of the AR-2 are not known, hopefully it has what the Army wanted; weigh around 3.5 kgs with advanced night-vision, holographic reflex sights, laser designators, detachable under-barrel grenade launchers etc. Otherwise it will be another waste of time – and yet one more round of delay tactics by DRDO. DRDO's small arms record has been quite dismal; 5.56 INSAS, light machine gun and medium machine guns. Ironically, 65,000 new generation rifles costing Rs 4,848 crores could have been imported in 2011-2012 to equip 120 infantry battalions, and DRDO-OFB would still have had the pie of producing over 1,13,000 such rifles through a JV under 'Make in India', but that was not to be. Incidentally, Army's cutting edge includes 380 Infantry Battalions and 63 Rashtriya Rifles (RR) Battalions – some 4.8 lakh foot soldiers; who need state-of-the-art weapons. Army's critical voids in small arms include: over two lakh new generation assault rifles; over 1.6 lakh close-quarter battle (CQB) carbines; over 1600 light machine guns, and; over 3,500 specialized sniper rifles. Because of our failure to indigenously produce a state-of-the-art assault rifle and other small arms, even the PMF, CAPF, SPG and special police units like Force 1 and Greyhounds are importing small arms. 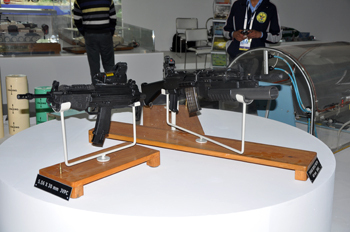 Army is reportedly seeking two lakh light-weight modular carbines with advanced optical sights and laser designators, of which 44,000 guns are required immediately. According to Pravin K Mehta, DG Armament and Combat Engineering Systems of DRDO, DRDO is not taking up any project to develop a 7.62 mm rifle for the Army. The new rifle is expected to be an imported weapon manufactured in India under collaboration by private firms or the OFB. According to P K Agarwal, Additional General Manager of Rifle Factory Ishapore (RFI), the R-2 (7.62mm x 51mm assault rifle) has met expectations of the project management team of RFI barring one adjustment that it has sought before the next round of trials. Hopefully, this is correct and not hype. RFI is preparing to make the necessary adjustment before offering the rifle for trials at the Infantry School, MHOW.